Many of the Muslim conquests against the Byzantine empire (both Arab and Turkic) came down to clever use of cavalry. 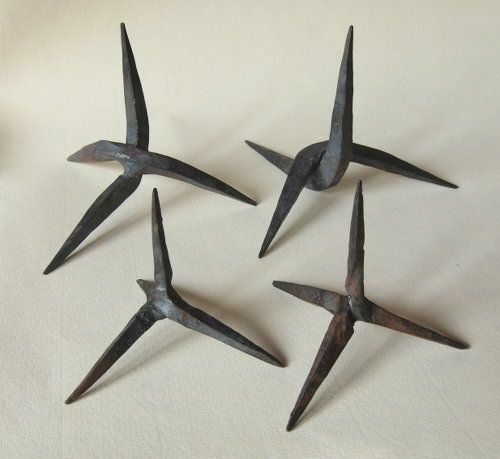 But the Romans had a handy helper against cavalry charges, the caltrop. Did the Byzantines forget to use them in all their defeats vs. the Arabs and later the Turks? I know they would not be effective against horse archers, but stationary archers usually outperform the mounted ones, while caltrops would protect them against the usual cavalry charges. The Byzantines did know about Caltrops. The so-called "Heron of Byzantium" is a name used to refer to an anonymous Byzantine compiler and commentator of two treatises: the De strategematibus, an instructional manual on the fabrication of siege machines and Geodesia, a manual on the use of a diopter, a kind of surveyor's theodolite. According to T.H. Martin, they were written in 938 or slightly later. Indeed, the stated aim of the author is to simplify the works of ancient mechanics to make them "accessible to all". It is addressed particularly to generals responsible for besieging cities held by the Arabs and beginners who are new to mathematics. The book is therefore intended as a practical manual and not intended for engineers. The two treatises are illustrated in "Vatican City, Biblioteca Apostolica Vatican, Vat. gr. 1605. It is a richly illustrated manuscript dated on paleographical grounds to the 11th century. In fold. 7v and 8r different tortoises and also two different kinds of caltrops are drawn: (wood caltrops) and (iron caltrops). Heron recommended against the iron caltrops to place wooden supports under the boots or to clear these away with farm rakes with large tine which some also called griphanai. As we may see in Fol. 8r (Fig.35), a man disperses the icon caltrop in front of a plaited laisa. It would have taken a lot more than Caltrops to save the Byzantine Empire. The Byzantine Empire fell to the Ottomans in 1453 when Europe was just entering the Renaissance, 1000 years after the Western Empire fell. When it fell it was just the capitol of Constantinople that was sacked. That was the culmination of 700 years of loosing ground to Islamic armies. During the rule of the Byzantium Emperor Justinian (527AD-565AD) the Byzantine Empire included most of the land surrounding the Mediterranean Sea including North Africa. By 700AD Byzantine had lost the entire middle east and North Africa. By 1373 Byzantium was economically shattered and relegated as a vassal to the Turks. When the Ottoman Sultan Mehmed II sacked Constantinople the once vast empire was little more than a city state and the Byzantium Empire had been at war with the Muslims for 700 years.. (634 AD - 1458). At the end their population was exhausted, their wealth was spent, their economy was shattered and perhaps worst of all they were mostly alienated from Western Europe who had come to their aid in the previous centuries. A few competent rulers in a row would have helped them more than caltrops, maybe just a few competent diplomats. Not the answer you're looking for? Browse other questions tagged byzantine-empire conquest islamic-history or ask your own question. Why did not the Byzantines attempt to recapture the holy land from the Arabs? Did the Mapuche conquer other non-Mapuche tribes? How did Islam spread before the invention of the printing press? What was the impact on Christianity when Islam conquered Palestine? Constantinople?